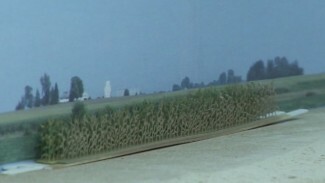 One of the great things about the model railroad backdrop is its versatility and its ability to affect the mood of a model. Depending on the scene you are attempting to create, your backdrop might benefit from more than those standard peaceful blue skies. Painting model railroad backdrops that are busier and more dynamic can help enhance the mood of your model, and there are few things more exciting than an ominous and powerful thunderstorm. A good thunderstorm can help to quickly spice up an otherwise ordinary scene, and you can easily apply storm clouds and rain to any model’s backdrop with the right colors and the proper technique. 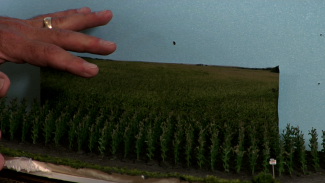 In other videos, we’ve shown you some of our best expert techniques for painting model railroad backdrops, including basic layouts for landscapes and tips for stippling and spray-painting clouds. In today’s lesson, we walk you through our favorite technique for adding an incredible thunderstorm scene to your backdrop. The process for adding storm scenes to your backdrops begins with painting a base layer for the sky. 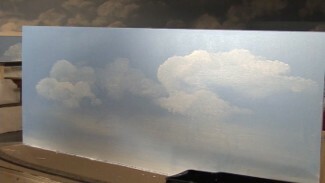 Sky-painting model railroad backdrops involves a unique method that expert modeler Tom Lund likes to call wet-on-wet. Discover how he uses multiple colors to establish an eerie sky, and then implements a stiff brush and the stippling technique to add intimidating clouds that shift from lighter colors on top to darker colors on bottom. Once he’s laid down a base coat for the sky and a few dark clouds, Tom shows you how to use long downward strokes for rain and a smaller brush for lightning. 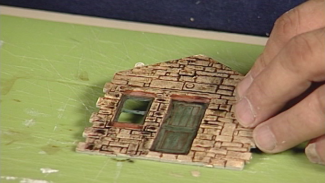 Painting model railroad backdrops is a matter of personal preference, and luckily with acrylic paint you can always come back and redo the scene if you didn’t capture the mood just right. Opt for blue skies or make a storm scene as dark and scary as you’d like. Do whatever you want, just make sure to have fun with it!